Jeremiah Davis poses on the basketball court. Photo by Huy Truong. Playing basketball since the age of three, he claims, Jeremiah Davis is the epitome of determination. Only a freshman, point guard and shooting guard, Davis already claimed a starting on the varsity basketball team. “[When making varsity], I was happy but then I was focused at the same time because it was a great accomplishment and I didn’t want to lose that spot I got. Plus, my whole life I was playing guys older than me so that’s what got me better at my game,” Davis said. Despite dealing with a torn ligament during preseason, Davis has proven himself to be a strong competitor on the team. 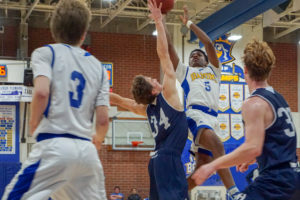 He has shown improvement in his shooting skills and overall good sportsmanship throughout the season, which hasn’t gone unnoticed by his coach and teammates. Jeremiah Davis shoots a layup. Photo by Ivy Duong. As the youngest player on the team, Davis’ average of 10 points per game has contributed to the team’s success. Practicing everyday and even on his off-time, his hard work has translated into his great performance this past season. “My first season on the team was pretty cool, pretty fun. All the seniors welcomed me as a regular guy and they made me feel comfortable as if I just made a new friend in school,” Davis said. Head Basketball Coach D’Cean Bryant said Davis had a good year and that he learned and grew both mentally and physically. “One thing I noticed [in the last game] was that he didn’t play the way he wanted to. He came out and still walked down to the front of the bench and high-fived everybody. To me, that’s the important part, seeing him grow not just as a basketball player but also as a person. [I know] he’s already ready to get back to work next year because he believes in himself and he believes that he can be a special player for this team,” Bryant said. “If [he] just puts in the work and takes care of his grades and health, he could easily play at a division 1 school. As of this year, [Davis] exceeded my expectations physically but mentally [he] just needs to find a way to become a leader and role model for his peers,” Bitzer said. 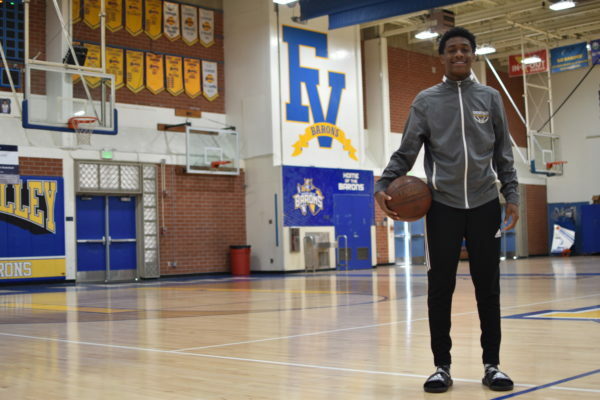 Both on the courts and as a leader for the Barons’ boys’ basketball team, freshman Jeremiah Davis is surely one to look out for in these upcoming years.